I am having a spot of trouble with my policies and applying them on my Windows 10 machine. I have several GPOs applied at the top of domain level, some contain only computer settings, some contain only user settings, and some contain both. If I do a GPresult /r, I can see a GPO applied under user settings, that contains both user and computer settings. I can see a GPO applied under user settings, even though that policy contains NO user settings. Finally, I can see a GPO applied under user settings that DOES contain user settings. What's then even more odd on top of that, is under user settings, I have 2 GPOs show as no applied (Unknown Reason), one of which is the default domain policy, but neither of them contain any user settings! As far as I can tell, all computer policies are applying correctly, the issue lies in just user settings. I need to figure out why GPOs show as applied even though they contain no user settings, and also why it shows an unknown reason for applying GPOs that also contain no user settings. EDIT: Screenshot of gpresult: Note that I have loopback mode enabled, so that's why they show up twice. 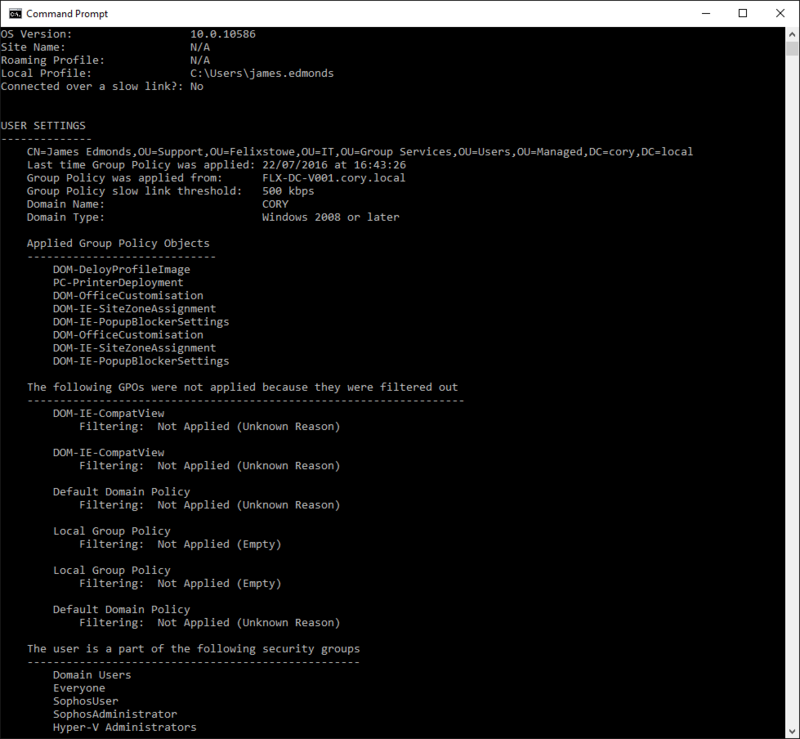 So after recreating the "DOM-IE-CompatView" GPO with exactly the same settings as before, it no longer appears as "Not applied (unknown reason)"
Should I use dcgpofix to restore the default domain policy back to its default settings as well? The GPO's are applied because both Computer and User configuration settings are evaluated unless you configure the GPO Status (on the Details tab of the GPO) to User configuration settings disabled. Only then would they not be applied. The group policy engine doesn't know that there are no User settings configured, so it applies the GPO, at which point the Client Side Extensions evaluate the GPO to see if there are any settings that they're responsible for that need to be applied. No actual User settings are configured by the GPO because you don't have any User settings configured in the GPO, but the group policy engine needs to apply the GPO nonetheless and let the CSE's evaluate the GPO for settings that they may need to configure. If you want the group policy engine to not apply the GPO then you need to set the GPO status to User configuration settings disabled. Can you post a screenshot of the Scope, Details and Delegation tabs of the Default Domain Policy? There was a major change in how group policy permissions work. If you applied patch KB3163622, and you use security filtering to determine how GPOs are applied, you'll probably have to make some changes to almost every group policy's permission scheme. Basically, you'll need to make sure every GPO can be Read by Domain Computers and/or Authenticated Users. To do that, use Group Policy Management RSAT tool and browse to your Group Policy Objects. Switch to the "Delegation" tab, and make sure either Domain Computers and/or Authenticated Users has Read permissions. For the GPOs missing these permissions, you'll need to hit the "Advanced..." button and Add "Read" rights to Authenticated Users and/or Domain Computers. Do NOT add the "Apply Group Policy" permission unless you want the policy to apply universally. After that, you should be able to run GPUPDATE /FORCE /BOOT to get your systems back in good shape. So I could not determine the root cause of the issue, but after having installed the anniversary update, all my applied GPOs show correctly, and the erroneous ones that said not applied (unknown reason), are not longer appearing. Not the answer you're looking for? Browse other questions tagged active-directory group-policy windows-server-2012-r2 windows-10 or ask your own question. Computer settings in group policy are not applying…User settings applied easily..how? How to apply proxy settings per computer for only a specific computer group?